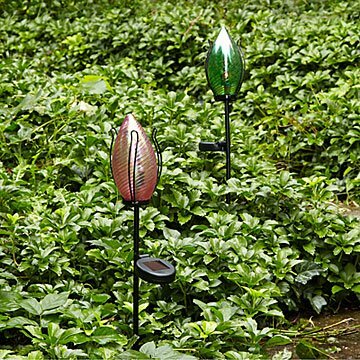 The iridescent pink or green evening glow of these hand-blown glass garden stakes is powered by the sun. Flowers are fueled by sunbeams, and these gorgeous glass tulips are no exception. Made by a team of Seattle glass artisans, each elegant, hand-blown blossom features a captivating iridescent surface. Within is a solar-powered light that dances enchantingly with the light once evening falls. Place one at your front door to guide evening visitors, stake one on your lawn to to add a dash of color, or spread several out along a pathway for magical parties and weddings. Handmade in Seattle, Washington. Bring indoors during the winter months.